Mr. Graham is a registered patent attorney with experience in a wide array of intellectual property matters. He has perennially been named a Washington Super Lawyer by Washington Law and Politics, including the listing of the “Top 40” lawyers for Intellectual Property. 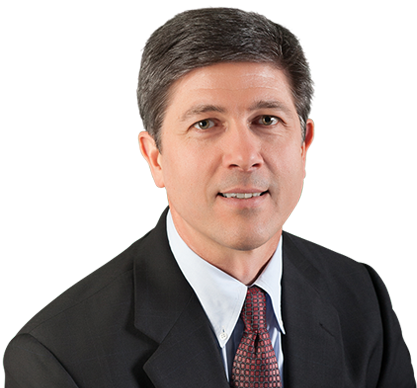 For the past decade he has also been listed by Chambers USA as one of the Leading Lawyers in Washington for intellectual property law, and has been named among the World’s Leading Patent Litigators by IAM 250. He has extensive litigation experience at the trial and appellate levels, and has successfully argued cases before the Trademark Trial and Appeal Board, the U.S. Court of Appeals for the Federal Circuit, the U.S. Court of Appeals for the Second, Eighth and Ninth Circuits, and many other courts. As a court-appointed special master, he has conducted claim construction hearings and issued written claim interpretations. Mr. Graham has participated in countless successful mediations on behalf of his clients, and is trained as a mediator within the Western District of Washington. He has authored numerous law review and journal articles on intellectual property law topics, many columns as an editorial board member and legal column editor for IEEE Software magazine, and a book entitled “Legal Battles that Shaped the Computer Industry.” For more than a decade Mr. Graham has been an adjunct professor at Seattle University School of Law where he teaches patent litigation and patent prosecution. He has also taught at the Pepperdine University School of Business and has lectured at the University of Washington School of Law. He is a board member and past president of the Seattle Intellectual Property American Inn of Court. Embodiments are directed to monitoring network traffic using network computers. A monitoring engine may monitor network traffic associated with a plurality of entities in a network to provide metrics. A device relation model may be provided based on the plurality of entities, the network traffic, and the metrics. Interest information for a user may be provided based on one or more properties associated with the user. An inference engine may associate each entity in the plurality of entities with an interest score based on the interest information, the device relation model, and the metrics. An alert engine may generate a plurality of alerts associated with the plurality of entities based on the metrics. Some of the alerts may be provided to the user based on ranked interest scores associated with the entities. An improved removable and installable fender for the bolsters of a trailer group relies on the use of a bracket on the bolster, the bracket having two retaining arms. A single fastening means is provided on the bolster to receive a bolt securing a medial portion of the end of the fender to the bolster, allowing the distal sides of the fender to be retained between the two retaining arms of the bracket and the body of the bolster. Methods and systems are presented for configuring and using a graphical container identified by an embed code (in a web page, e.g.) at least partly presented by a mobile client device, facilitating a consumer’s rapid review of several items of video preview content each derived from a movie or other video-containing primary content. A flying vehicle with a fuselage having a longitudinal axis, a cockpit extending substantially from the center of the fuselage, a left front wing extending from the fuselage, a right front wing extending from the fuselage, a left rear wing extending from the fuselage, a right rear wing extending from the fuselage. Each wing contains a rotor rotatably mounted and a direct drive brushless motor providing directional control of the vehicle. A centrally located ducted fan encompasses the cockpit and provides VTOL capabilities. The central location of the cockpit and central ducted fan aid in balance and stability. The central ducted fan is itself a brushless motor with the stator windings encapsulated in the ducted fan housing and rotor magnets within the fan. All motors and rotatable mounts are controlled by a fly-by-wire system integrated into a central computer with avionics allowing for autonomous flight. Systems and methods for machine vision are presented. Such machine vision includes ego-motion, as well as the segmentation and/or classification of image data of one or more targets of interest. The projection and detection of scanning light beams that generate a pattern are employed. Real-time continuous and accurate spatial-temporal 3D sensing is achieved. The relative motion between an observer and a projection surface is determined. A combination of visible and non-visible patterns, as well as a combination of visible and non-visible sensor arrays is employed to sense 3D coordinates of target features, as well as acquire color image data to generate 3D color images of targets. Stereoscopic pairs of cameras are employed to generate 3D image data. Such cameras are dynamically aligned and calibrated. Information may be encoded in the transmitted patterns. The information is decoded upon detection of the pattern and employed to determine features of the reflecting surface. Embodiments are directed towards efficient variable length encoding and decoding of numerical data sets using new interleaved start-step codes. The proposed codes minimize the space required to represent and store numerical values in data intensive applications. Efficient implementations are possible at higher processing speeds and reduced code size than current state-of-the-art codes. Encoding engines select one of a plurality of numerical values from an input stream. The encoding engines convert each numerical value into a codeword. Each codeword consists of a plurality of data bits interleaved with a group of control bits. The encoding engines provide each codeword to an encoded stream. Decoding engines select one of a plurality of codewords from an encoded stream. The decoding engines convert each codeword into a numerical value. The decoding engines provide each codeword to an output stream. Interleaved codes can add intrinsic value to Blockchain applications and the Internet of Things (IoT).